2. Whisk together whole-wheat flour, all-purpose flour, sugar, ¼ cup of wheat germ, the baking powder and salt in medium bowl. Beat milk, oil and egg substitute in small bowl until blended. Add milk mixture to flour mixture, stirring just until flour mixture is moistened (do not overmix). 3. Fill muffin cups evenly with half of batter. Top each one with 1 teaspoon raspberry or strawberry jam. Cover evenly with remaining batter. Sprinkle with remaining 2 teaspoons wheat germ. 4. Bake until browned and toothpick inserted into center of muffins comes out clean, about 25 minutes. 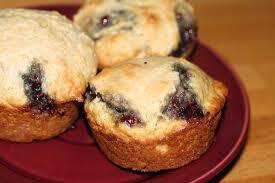 Cool muffins in pan on wire rack 3 minutes; remove muffins from pan and serve warm.